Hotel Los Patios *** Set in the natural surroundings of Almería's Cabo de Gata-Níjar Natural Park, this rural retreat blends a traditional, whitewashed rustic building with the most contemporary of interior design. A 15-minute walk from the beach, this eco-friendly hotel allows you to relax in a tranquil atmosphere. More information . Cortijo El Paraiso **** Hotel situated in the Cabo de Gata-Nijar National Park that enjoys unique views over the Escullos Bay. The hotel is small and cosy and is situated only 1 km from the sea, right in the middle of nature. More information . Bitacora ** Apartment hotel complex situated in the heart of Cabo de Gata-Nijar Natural Park, bordering the fishing village of Las Negras. The establishment offers 7 modern, comfortable and spacious apartments, from which you can enjoy views of the beautiful Mediterranean and the spectacular Cabo de Gata. More information . 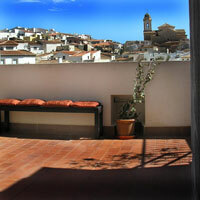 Venta El Museo **** Hotel set in a typical white Andalusian village, in the heart of the Sierra Alhamilla. Each of the rooms have been individually decorated, inspired in different styles. The hotel location is the perfect base from which to explore this part of the province of Almeria. More information . Hostal Las Gaviotas ** Guesthouse situated in the heart of the Cabo de Gata-Níjar Natural Park, in an area that boasts some of the last stretches of unspoilt beaches in the Mediterranean. San José is a charming coastal fishing village that stretches around a bay. More information .